Red Ceramic Vase. VOLCANIC CRATER Vase. Nature Inspired Ceramics. Red and Black Crackled Bowl. Hand Built Pottery. Ceramic bowl. Salad stoneware bowl. MELON BOWL. Soup bowl. Nature inspired hand built pottery. Fine pottery by Zen Ceramics. Price per 1. Ceramic teapot. Handmade stoneware woodland teapot. Hand built ceramics. Ceramic Pottery. Announcement Spring is in the air! ENJOY SPRING SPECIAL WITH 15% OFF ON ALL CERAMICS INCLUDING CLEARANCE PLUS UPGRADE TO PRIORITY DOMESTIC SHIPPING ON YOUR ORDER OVER $30. CHECK OUT CLEARANCE SECTION AND SAVE UP TO 35%. Inspired by nature handcrafted ceramics of organic and earthy quality from sculptural forms to functional pottery. My strongest inspiration comes from Mother nature and its influences on the shape of plants and animals, trees and rocks, both on land and underwater. New techniques and forms continually stimulate my interest in clay. The process of integrating various media with clay, like metal wire, stones, sand and wood to create dynamics has a great appeal to me. It is fascinating to take something essentially flat and turn it into organic form with volume creating a synergy between layered color, texture and movement. My favorite firing method is raku but I also use high fire oxidation firing. Ceramic Vase. IKEBANA Vase. Nature Inspired Seed Pod. Hand Built Sculpture Vase. Zen Ceramics. Ceramic Art. Handmade Ceramics. Naked Raku Vase. Zen Primitive Ceramic Vase. White Raku. Nature Inspired Naked Raku Organic Zen Ceramics. Raku Pottery. Jewelry Tree Holder. Ceramic Jewelry Display. Nature Inspired Ceramic Sculpture. Ceramic Art. Hand Built Ceramics. Coral Tree. Raku ceramic vase. Volcanic rock vase. Nature Inspired vase. Raku pottery. Black raku vase by Zen ceramics. Ceramic Bowl. Set of 2. Red Poppy Bowl. Nature Inspired Flower Bowl. Serving Bowl. Ice Cream Bowl. Hand Built Pottery. Handmade Ceramics. Ceramic Bowl. Ceramic Sea Urchin. WASHED ASHORE. Nature Inspired Vase. Organic Hand Built Ceramics. Zen Ceramics. Ceramic Soap Dish. Beach Stone Soap Dish. Inspired by Nature. Blue and Beige Zen Stone. Hand Built Pottery. Zen Ceramics. Naked raku vase. Ceramic red raku vase. Naked raku ceramics. Organic zen vase. Nature inspired ceramic vase. Raku crackle pot. Ceramic Flower Vase. Nature Inspired CALLA Vase. Large Ceramic Sculpture. Black - White Vase. Ceramic Art. Hand Built Ceramics. Ceramic Bowl. URCHIN. Ceramic Salad Bowl. Nature Inspired Bowl. Ocean Blue Green Dish. Hand Built Ceramics. Zen Ceramics. Ceramic Wall Vase. Birch Tree Vase. Nature Inspired Ceramic Sculptural Vase. Wall Art. Ceramic Sculpture. Hand Built Ceramics. Beach Rock Ceramic Vase. Stoneware Zen Vase. Nature Inspired Vase. Hand Built Ceramics. Zen Ceramics. IMPALA Ceramic Urn. Art Sculpture. Impala Horn Multimedia Jar. Inspired by Nature Zen Ceramics. Cremation Urn. Keepsake Urn. Price per 1. Ceramic Vase. BLACK CORAL. Bud Vase. Nature Inspired Ceramic Vase. Black and White Vase. Hand Built Pottery. Raku Necklace. Ceramic Necklace. Handcrafted Raku Ceramic Pendant. Wearable Art. Nature Inspired Raku Necklace. Boho Necklace. Ceramic Vase. Zen Beach Stone. Nature Inspired Vase. Holiday Gift For Her. Lime Green - Yellow Sand Stone Vase. Ceramic Bottle. Whimsical Ceramic Vase. Bud Stoneware Vase. Rd Vase. LARGE LIPS Funky Vase. Hand Built Ceramics. Ceramic teapot. Russian matreshka teapot with Russian churches. Golden stoneware teapot. Hand built pottery. Raku Ceramic Necklace. SALE. Raku Button Pendant Leather Cord. Wearable Art. Raku Handmade Jewelry. Ceramic OWL Vase. Sale. BIRD NEST. Hand Built Black Stoneware Vase. Nature Inspired Tree Vase. Ceramic Pottery. Handbuilt Ceramics. Ceramic Ballet Shoes. Art Ceramic Sculpture. Pointes Ceramic Sculpture. Hand Built Ceramics. Dancers Ballet Shoes. Ceramic Art. Ceramic Vases. Beach Stone. Zen Stone Vase. Nature Inspired Vase. Hand Built Ceramics. Bud Vase. Zen Ceramics. Ceramic vase. ABSTRACT PAINTING Vase. Handcrafted stoneware Vase. Hand built poterry. 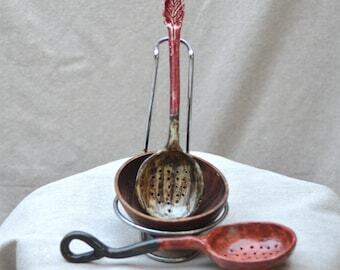 Ceramic Berry Bowl - Pottery Colander - Kitchen Strainer - Ceramics and Pottery - Handmade Kitchenware - by Zen Ceramics. Ceramic Bowl. Set of 2. Red Poppy Flower Bowl. Serving Bowl. Handmade Ice Cream Bowl. Nature Inspired Zen Ceramics. Hand Built Pottery. Ceramic Teapot. STACKED STONES TEAPOT. Stoneware Sculptural Teapot. Cottage Chic. Hand Built Pottery. Signature Ceramics. Zen stone teapot. Ceramic spoon. Ceramic skimming spoon. . Kitchen strainer - colander. Ceramics and pottery. Handmade kitchenware. Zen Ceramics. Red agate slice ceramic Urn. Cremation Urn. Keepsake Urn. Pet Urn. Ceramic Lidded Jar. Inspired by nature ceramic container. Zen Ceramics. Beach Stone Ceramic Vase. Nature Inspired Zen Stone Vase. Organic Zen Ceramics. Garden Home Decor. Hand Built Ceramics. Ceramic Art. Ceramic Vase. Lacy lavender and pink crystal stoneware vase. Hand built pottery. Zen ceramics. Very unique wall art for a kitchen. It is well done and shows attention to detail. Wall Art. Tea Cup and Teapot Set. Ceramic Tile. Ceramic Wall Hanging Art. Ceramic Coaster. Kitchen Decor. Red Tea Cup Decor Plaque. These are so beautiful, and even more beautiful in person! Thank you Elena for making these stunning ceramics. This handmade ceramic vase is beautiful! It looks perfect next to my front door and provides a lovely welcome for guests. I enjoyed communicating with Elena throughout the process. She responded promptly and is very kind and accommodating. Custom Order for Kari. Ceramic Birch Tree Wall Vase. Ready to start glazing! Not my favorite part.. It will take at last a couple of days to finish glazing all the bisque. Should be done before Thanksgiving. Looking for unique Holiday Gifts? Keep checking out my etsy store for new cool handmade ceramics! Ceramic Flower. Home Decor. Nature Inspired Blue Flower. Ceramic Sculpture. Fine Art. Hand Built Pottery. By Zen Ceramics. Thank you from ZENCERAMICS to all my followers. Enjoy 15% off your total purchase. Enter coupon THANKYOUGIFT into a promo field at the check out. San Diego Art Institute. My work at display at a Regional show. I always has always had a special interest in art, worked as a Marketing Director in the Museum of History of St. Petersburg (Peter & Paul Fortress) and with many well known Russian artists. While traveling all over the world I enjoyed learning about the richness of new cultures and art, meeting new people and observing their lives. One of the great strengths of art is that it crosses the border, fuses cultural differences and opens your mind. My art is truly international; it is inspired by diverse cultures and beauty of nature; it is the expression how I see the world. I always wanted to learn how to make ceramics but never had time nor opportunity. My husband was teaching in Universality of Cincinnati and I keep trying to enroll in the Art Program in UC while still working full time as a Marketing Director of a Shopping Center. The program was in such demand that I hard time getting in. I finally had to go to the professor in person and begged him to let me take his class. In March 2006, I enrolled in a hand-building ceramic class in the College of Design, Architecture, Art and Planning. From the very beginning of that journey I was hooked. I committed myself fully to this new form of artistic expression. I was lucky that I had a supportive husband so I retired from the corporate world and went full speed taking intensive training in hand-building, glazing, and various firing techniques, I finished my Advances ceramic course series in June of 2007. My strongest inspiration comes from Mother nature and its influences on the shape of plants and animals, trees and rocks, both on land and underwater. New techniques and forms continually stimulate my interest in clay. The process of integrating various media with clay, like metal wire, stones, sand and wood to create dynamics has a great appeal to me. It is fascinating to take something essentially flat and turn it into organic form with volume creating a synergy between layered color, texture and movement. My favorite firing method is raku but I also use high fire with reduction process and oxidation process. Each piece is hand-built or thrown on a wheel and finished with food safe glazes except raku. Raku ceramics by their creative process and their very nature serve only for decorative purposes and are not intended to be used for food. I am a member of National Council on Education for the Ceramic Arts, Clay Artists of San Diego, San Diego Art Institute. Originally from St. Petersburg, Russia I have always had a special interest in art, worked in the Museum of History of St. Petersburg (Peter & Paul Fortress) and with some amazing Russian artists. If for any reason you don't like the item you purchased or you expected something different, feel free to return it to us for an exchange or refund. Email us at: elenaandnorm [!at] gmail.com before sending the order back and state the reason you want to return it. This will ensure a prompt and accurate refund. The return must be made within 14 days after the purchase. Items that are to be returned must be in original shape. If an item has been damaged, we will not be able to refund your purchase. Please, package the item(s) securely. Be sure the package is taped and labeled clearly and sent insured postage paid. Please note, you will be responsible for paying for return shipment. We accept credit cards and checks (only within US). You can also pay through Pay Pal using your credit card. Your jewelry will be shipped upon receipt of payment. Sales Tax of 8.5% will be applied to all orders from residents of California. Orders are shipped within 3 days after receiving the payment. All the ceramics are shipped by UPS Parcel Service unless you request another shipping method for additional charge. It normally takes approximately 7-10 business days. I more likely do complimentary upgrade to Priority Mail on packages that are under 4 lb. The fees vary based on the weight and size of the item. All ceramics include shipping insurance. I pack my ceramics very well. It is usually double boxed. in case it was damaged during transportation, please do not disregard the packaging. Take photos and email me ASAP. I will refund you immediately after the insurance claim is submitted. I don't accept returns on CLEARANCE items.